To climb Pico de Orizaba is to climb the highest peak in Mexico and the third highest peak in North America. Locally owned and operated, Summit Orizaba is located in the shadows of Pico de Orizaba in the quiet and safe town of Tlachichuca. We continue to lead thousands of successful climbers to the top of Mexico’s highest peaks. 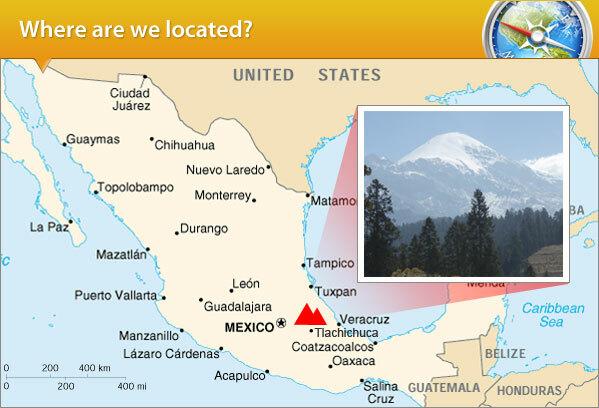 Located southeast of Mexico City, the massive volcanoes of Popocatepetl, Iztaccihuatl and El Pico de Orizaba dominate the surrounding skyline. Orizaba is the third highest peak in North America, towering over Mexico at 18,700’~5,700 m above sea level, and surrounded by small Indian villages. Iztaccihuatl, known as The Sleeping Lady, offers interesting and varied climbing at an elevation of 17,373’~5,600 m.
Our volcano climbing expeditions to Orizaba and other peaks combine a great mix of culture and climbing, continually proving the Mexican volcanoes to be an excellent introduction or continuation to high altitude mountaineering. Pico de Orizaba was on our climbing groups list for a while. After much research we chose you (Summit Orizaba) for your company history, value, and track record of success. We only wish you had a guide service to assist with our next big mountain! Thanks for getting our entire group of eight to the summit. Summit Orizaba helped me achieve a dream of climbing a high altitude peak I wasn't sure I could do. Thank you! Thanks again meeting my expectations and encouraging our group all along the way. Joaquin was attentive to our 'rookie' needs and make us feel very safe comfortable as possible. I have just returned to Ireland after a successful climb of Ixta and Pico de Orizaba. I went with my sixteen year old daughter and my brother-in-law and we booked the whole trip through Summit Orizaba. They organised the guides, cook, tents, food water, flats etc. so that when we arrived everything was ready to go. Our trip went extremely well, we spent 9 days in Mexico we all achieved both the summits. They were very well organised and without issue. I would use Summit Orizaba again and would recommend them to anyone who wants everything organised and hassle free. We had a great time. You guys did a great job and put together a great team. For the cost, I feel we got a great deal. Our summit day went quite smoothly. I will certainly recommend Summit Orizaba to anyone who wishes to travel to Mexico. I don't know how you do it, but it was nice to have such prompt service throughout every part of our trip. My favorite part was being able to actually experience Mexico and not just be with a bunch of American strangers in Mexico. It was nice to have everything be so authentic and have a Mexican guide and dinner with by Maribel who is so gracious and attentive to whatever we needed. My experience was absolutely incredible. As far as the trip, hike and tour in their entirety, I speak and think highly of the land and the people. It's a beautiful land with beautiful people. The culture is one to be prepared for, but it's always a shock when you experience it in person on hand. The experience I had with Summit Orizaba was just as pleasing. I was more than positively surprised at the support of the staff. The Express trip was amazing, the people are among the friendliest and accommodating I have ever come across, and I have nothing but respect for the staff and guides who take this trip many times per month! The last night was one of the hardest of my lives, and is an accomplishment that can only be truly appreciated with hindsight. I had a great time on the Orizaba trip. It was the highest peak I have ever been on. I think anyone with good physical fitness and the right drive can make it to the top and enjoy the experience of life time. Good company with friendly staff! Traveling from the UK and not having visited Mexico before, it was well worth planning our climb with Summit Orizaba. You took care of all the concerns and we were able to make our holiday a memorable one. We had our best climbing season on record! We look to make 2018-2019 even better. Contact Us today to confirm your Orizaba Climb! Copyright © 2019 Summit Orizaba. All rights reserved.